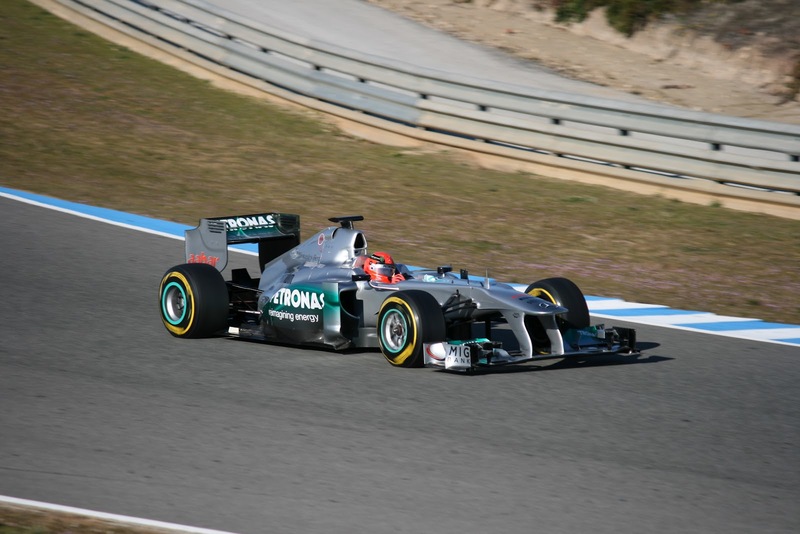 The story of the 2012 F1 season began in earnest during the week just passed, in the four-day testing session at the Jerez circuit in southern Spain. Like all good stories, F1 seasons tend not to reveal their plot with any certainty in the opening paragraphs. Red herrings are just as likely as signposting at this stage. Trying to work out how a F1 season is likely to pan out on the basis of pre-season testing, let alone on just the first pre-season test, is rather like trying to make bricks using straws in the wind. It doesn't stop us trying though. So, what can we decipher from the four days at Jerez? Firstly, aesthetics. Even if F1 exists for another one hunderd years, 2012 will in all probability be looked upon as the year of the platypus. Noses with an unsightly downwards step just ahead of the front wheels are now, with the honourable exception of McLaren, de rigueur it seems. The obvious thought on first sight is that they can't possibly work, seeming like anathema to the usual sleek lines on an aerodynamic racing car. But as is usually the case, they reflect the restrictions of the rules and necessary compromise by the designers to produce the best performance. 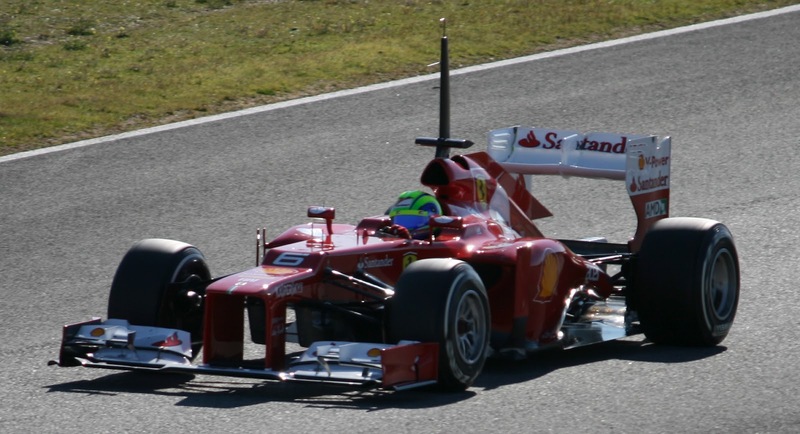 One of the few rule changes for 2012 is that the maximum height of the nose (measured just in front of the front bulkhead) has been reduced by 75mm, so to avoid side impacts involving the nose of one car coming into contact with the driver's head in the other car potentially. 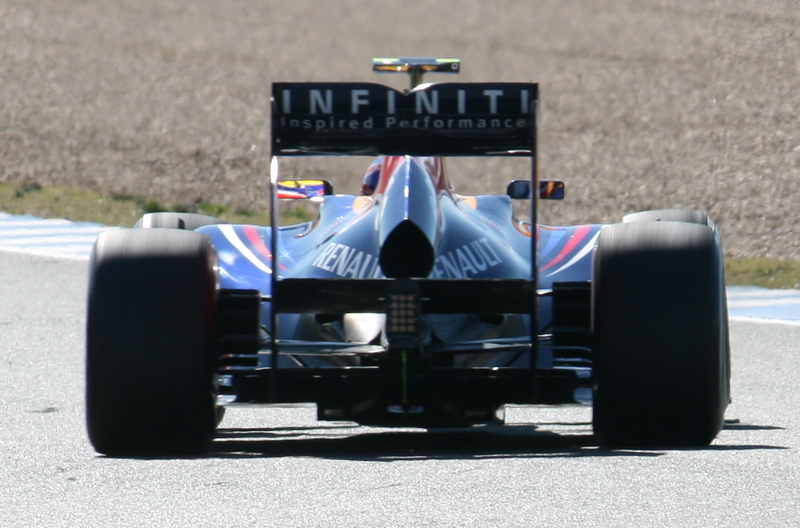 However, a parallel reduction in the maximum height of the front bulkhead itself couldn't be agreed, and most teams prefer to keep the bulkhead high to maximise the area under the nose for aerodynamic reasons (such as to channel more air through to the diffuser as well as to have more space for undisturbed front wing airflow) and are prepared to sacrifice a smooth plane along the top of the nose to achieve this. Hence the platypus look. I'm told that once the cars are moving one gets used to their eye sore noses pretty rapidly, and indeed F1 fans have an uncanny ability to 'get used' to designs that look rather odd at the first look. I'll believe it when it happens in this case though. And on to the important stuff: the pecking order. Well, the first point isn't a surprise. Red Bull still look like the team to beat. Of all the cars on show at Jerez, theirs looked the most planted and stable, and the consistency of rapid lap times looks ominously like that seen for most of last two seasons. 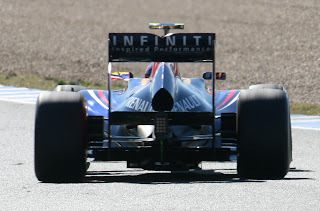 Adrian Newey even managed to find an innovation in the platypus nose, adding a vent in its step. This caused some intrigue, though no one believed Newey's explanation that it was 'simply for driver cooling' - I don't recall Red Bull losing many races last year because their drivers' knees got too warm. Instead, the vent is most likely to reduce airflow separation, keeping it gripped to the car as much as possible, as it goes over the nose step. The question therefore is not when Red Bull are going to stop, but who is going to stop them. Of their closest challengers of previous seasons, there has been lots of talk about Ferrari at Jerez, but unfortunately for them not for the right reasons. Ferrari visibly have gone radical this year. There's nothing wrong with that in itself, indeed it's probably exactly what they need given the creeping conservatism in their designs in recent times. But after persistently failing to trouble the top of the timesheets at Jerez first Felipe Massa, and then technical chief Pat Fry, let on. Massa admitted there was 'a lot of work' and then Fry said 'he is not happy' with where they are. Seemingly the car is behaving inconsistently though corners - fixing how it behaves at one point of the corner apparently messes up the rest of it. Perhaps worse, their wind tunnel correlation problems of last year may be returning, with Fry saying he 'wouldn't say it (the correlation) was perfect'. With a radical design it could be said that it's inevitable it'll take longer for any team to understand the car, and Ferrari will be hoping that their woes thus far are a case of finding the bottom rung of the set up ladder, rather than fundamental flaws. The forthcoming tests will give us more of a clue. Still, all hands will be to the pump at Maranello and they've turned seasons around plenty of times before. And given the F2012's abundance of novel design features only foolish rivals will be writing off the Scuderia at this stage. 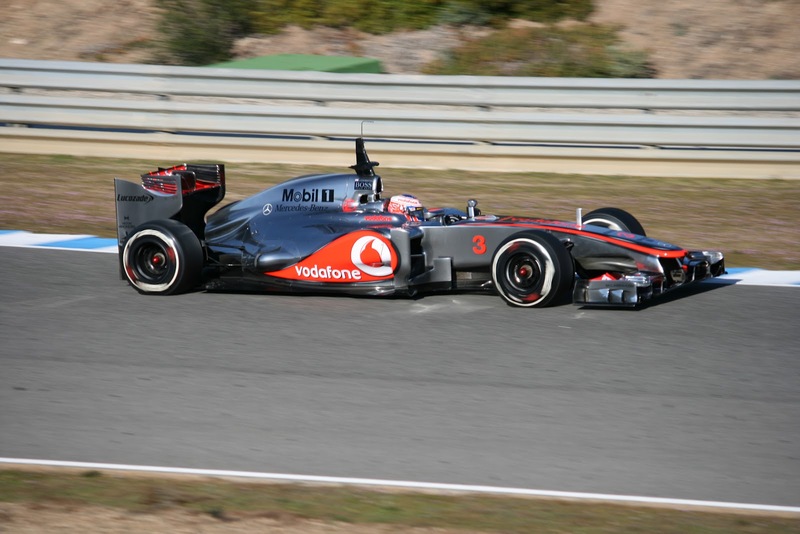 The McLaren MP4-27: solid but how spectacular? Then there's McLaren, whose machine, as well as winning all the awards for aesthetics, looks solid, reliable and consistent enough, as well as seeming to at least be in Red Bull's ballpark on pace, if perhaps not totally with them. Both drivers sound positive and Lewis Hamilton thinks McLaren are 'there' with Red Bull, but it was also interesting that he commented that his team had been 'quite aggressive' on fuel loads in Jerez. In F1 parlance that usually means running lighter than others. If so, McLaren may be a little further away than we thought. The MP4-27 also raised some eyebrows when it was launched, but for opposite reasons to why the new Ferrari did. 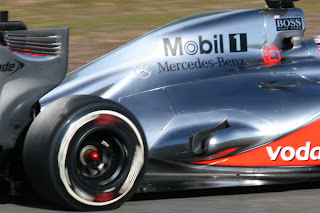 The new McLaren had a rather conventional look, and according to the likes of Gary Anderson and Mark Hughes (who know about these things) it didn't outwardly appear to be doing any necessary pushing of boundaries in the pursuit of Red Bull. Of course, there's only so much that can be told about a car's competitiveness by looking at it, and there will be plenty of developments and detail to come. But it's worth reflecting that this time last year people were saying exactly the same thing about the newly-launched Ferrari, and that assessment turned out to be spot on. As mentioned, major reshuffling of the order between last year and this is not expected. 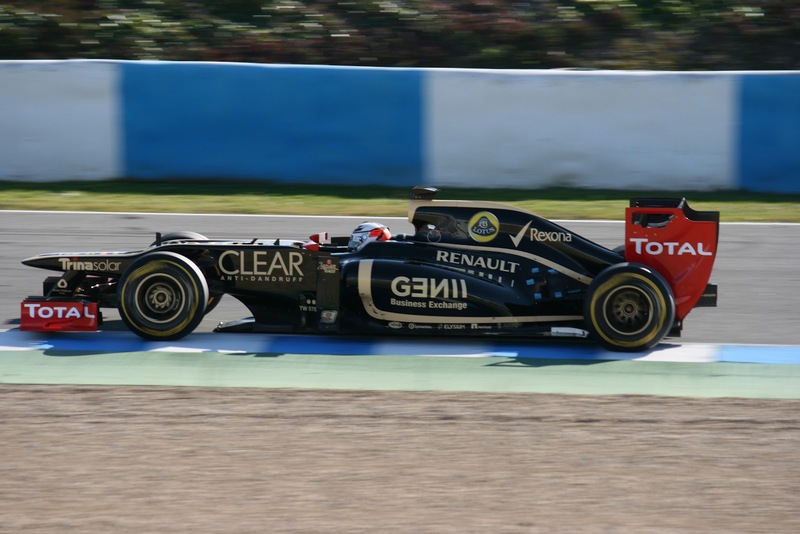 But on the evidence of Jerez Lotus (née Renault) may be 2012's highest climbers. 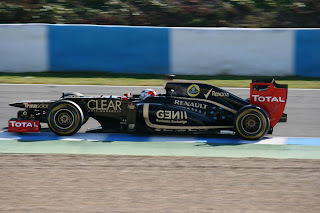 In Romain Grosjean's hands the Lotus set the fastest time of the week of any of the 2012 cars, and the car looked stable, rapid and consistent. This got the pitlane taking all things Lotus and Lewis Hamilton even mentioned the impression they'd left on him in his press briefing. The machine was also ultra-reliable - Grosjean and Kimi Raikkonen completed over 400 laps between them - and the team are exuding quiet confidence. Kimi also looks assured and focussed out of the car, even being engaging with journalists on occasion, and doesn't outwardly appear to have lost any of his ability when out on track. He's also clearly galvanised his team, them having nothing but good to say about him. The apparent off-track instability and uncertainty at the team from last year seems like from another age. Grosjean also looked handy, and could barely suppress a smile in his two days' running. Few expect a Lotus to be on pole in Melbourne, but there was enough on show at Jerez to suggest that they could get in among the 'big four' teams, possibly comfortably so. Indeed, it's easy to forget that, such were the problems associated with the forward-facing exhausts in 2011, that last season was pretty much a write-off for them, most development proving impossible. Some bounce back should therefore be expected. They may yet achieve even more than that. The gap between the 'big four' and the midfield could indeed be closer generally this year than last, with Toro Rosso, Williams and Force India having some reasons to be cheerful from their Jerez running. This often happens in years of relative rule stability between seasons, in that it gives the midfield teams a chance to learn from the front runners, who themselves have a much shallower learning curve than those behind. Michael Schumacher - back to his old self? As for the member of the 'big four' not yet mentioned, Mercedes have yet to show their hand. 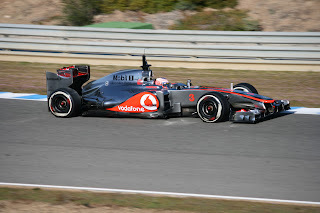 They brought their 2011 cars to Jerez, conducting tyre testing with the new Pirellis essentially. It remains to be seen whether this is a clever move, given they'll now only have two tests in which to get their 2012 car right before the first race (the fourth test is mid-season). Nico Rosberg set the quickest time of everybody across the four days at Jerez, with Michael Schumacher placed third just shy of Grosjean's time. There were nine tenths of a second between the two Merc pilots' best, though this is most probably explained by them having set these times two tyre compounds 'apart'. Their being quicker than the 2012 cars owes something to their continued use of the exhaust blown diffuser, given their 2011 spec. It did at the same time set the odd tongue wagging that the car featured some stellar 2012 pieces that contributed to the quick times. That remains to be seen. Which brings us neatly onto the Pirelli rubber. Few could find anything bad to say about their 2012-spec product. The gap in laptime between the compounds, deliberately, looks much closer this year than last, which should lead to much more variation on tyre strategy (rather than the run of softer tyres most of the way and bolt on the harder tyres at the end, which became the norm last year). Wear rates look relatively good, as does rear end stability, and the ability of the tyres to 'lay down rubber' looks much stronger. Paul Hembery was man of the year in 2011 in my book, and with a year's experience of supplying tyres in F1 it looks like the job Pirelli will do in 2012 will be even better. On the innovation front, if there is to be a 'next big thing' this year, the equivalent of the f-duct or exhaust blown diffuser, it has yet to reveal itself. Indeed, Peter Sauber has gone so far as to say he doesn't expect there to be any such breakthrough for 2012. One technical area that could result in extended controversy is the new exhaust regulations. While the positioning of the exhaust (and regulation of engine mapping) has been proscribed in an attempt to eliminate exhaust blowing for aerodynamic benefit, the problem is that the concept cannot be uninvented and teams are doing their darnedest to get whatever advantage they can while operating within the new restrictions (as you'd expect). It seems the rules lack clarity, as does its policing, with deliberate aerodynamic advantage from the exhaust not permitted apparently but incidental advantage being OK. McLaren and Ferrari, the two teams who are said to have taken things to the edge more than others, have had their designs declared kosher. Lotus's technical director James Allison summed it all up: 'There is an element of subjectivity in the exhaust rules...I'm sure that there will be a range of interpretations as to where that line of acceptability is and a bit of argy-bargy.' This one has the potential to run as well as, appropriately, produce a lot of hot air. So, with all of this where will the F1 in 2012 story take us from here? Well, to borrow from former UK Prime Minister Herbert Henry Asquith, 'I am afraid we must wait and see'. Great summation, i haven't had time to keep up with testing so was very informative!